This article is a continuation of Mama Robotnik's epic telling of the story of Nintendo's Metroid series. Please make sure that you've read part one—and its official explanation of where this lore comes from—first. And make sure your browser is ready for a long piece stuffed with awesome images. Samus performed great heroics in her dying state, and these seemingly discordant endeavours led to the salvation of the universe. Samus discovered an erratic Federation Aurora Unit on the ancient Chozo colony of Elysia, and cured its infection. The Aurora Unit was able to reconcile current universal events with Skytown’s ancient data regarding the living world Phaaze, and retrieve the triangulated region of space where the poisonous planet was hidden. 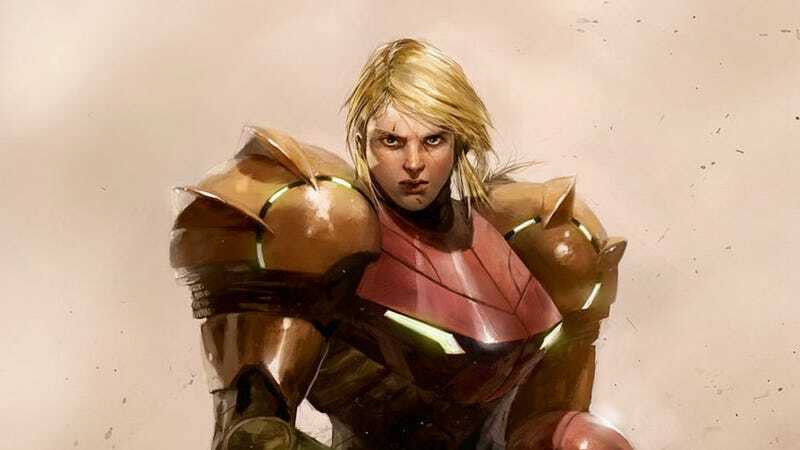 Samus then discovered the wreckage of the Galactic Federation vessel Valhalla, and learned from its logs that the Space Pirates stole an Aurora Unit to be implanted into Phaaze. Samus landed on the ancient planet Bryyo, and overcame its devolved creatures to restore the Federation access to the fuel gel mines needed for the war effort. The story of Metroid, with its living planets, vengeances spanning millenia, collapsing empires, prophesised apocalypses and poisoned heroes, finally comes to its end. The lore, speculation and theories above use the Metroid games as their primary sources. Secondary materials such as manga, strategy guides, developer interviews and instruction manuals are often in conflict with each other – and the games themselves – and are therefore not included. The article also does not include the events of Metroid: Other M; since that game was released, its story and characters have become impossible to resolve with the rest of the franchise. The first Metroid Prime game was released with two slightly different stories – following the original USA release, Retro Studios changed some important lore entries regarding the nature of the Metroid Prime creature. This article uses the most recent and revised story, as present in the international Metroid Prime Trilogy release. In this version of events, the Tallon IV Leviathan shield was never breached by the Space Pirates, and the armoured Metroid creature within arrived with the Phazon seed from Phaaze. The artists cited are stunning masters of their mediums. You are once again invited to follow the links provided and explore their magnificent portfolios. The images in the article are not as vast and as detailed as the artists’ portfolio pieces. My heartfelt appreciation to hundreds of my fellow NeoGAF members; over the years, their encouragement and feedback led me to become increasingly ambitious with my writing and research. Thanks to Kotaku for reaching out to me, and their support in publishing my first professional article.